After a difficult year filled with work and family demands, my best friend and I decided to reward ourselves with a trip to the United Kingdom. The plan was to spend eleven restful days touring Shakespeare’s London, meandering through Jane Austen’s countryside, and exploring Brontë’s haunted moors and gothic ruins. Truth be told, I think we envisioned ourselves as two characters from a Jane Austen novel, swathed in muslin, perched prettily atop a phaeton, frilly parasols shielding us from the sun, occasionally yawning behind our hands, as the rolling green hills passed us by. Even while my lips were muttering the mantra, my feet were moving me in the direction of the accident. It was as if the spirit of Florence Nightingale had suddenly possessed my body. I ran over to the young man and began administering first aid. This is a big deal because I am the most squeamish person alive. I never watch ER and get lightheaded at the very thought of donating blood, but there I was, squatting on the ground, checking the poor, prostrate blader for wounds. Twenty minutes later, a tall, muscular motorcycle cop arrived on the scene. By this time, shock had set in and the blader was extremely anxious and agitated. At one point, Mr. Gorgeous Highlander Cop says to me, in his lyrical, Sean Connery-like voice, "Do you know that you are an angel?" Suddenly, the horror of the moment faded away. I was no longer on the mean streets of London, but frolicking in a heather-filled field somewhere in the Highlands. Of course, I was still distraught about Kennedy, but . . . sigh . . . he called me an angel. That Braveheart on a Harley called me an angel. Maybe London wasn’t so bad after all. Lesson: Actually, there are three lessons here. 1. If at all possible, avoid the streets of London. If travel about the city is necessary, put on a blindfold and take a taxi from point A to point B. 2. Take a first aid class before traveling. You never know when you will be called on to save a life. 3. And the most important lesson of all? Always, always have a smart outfit on and your makeup artistically applied when touring about. Don’t opt for the comfortable khaki shorts and hiking boots. You do not want to have an encounter with a strapping Highlander sans blush and perfume. After our exhausting walk to Hyde Park, we decided to return to our hotel, order two cartons of Haagan Dazs via room service, and relax. Even with the bowls of chocolate ice cream, we could not cool down. We had the air condition running, but we were still hot and sticky. I decided to open one of the windows. Unfortunately, we were staying in an old, albeit grand, hotel with ancient casement windows that would not stay open. They kept sliding shut. Eureka, I thought! I will use my camera’s tripod to prop one window open. It worked. The window stayed open and a fuel-exhaust tinged breeze soon filled our room. A few minutes later, there was a knock at our door. When I answered it, I found a small battalion of stern-faced Buckingham Palace guards glowering at me. They stormed into the room, looked under the beds and in the bathroom, searched our luggage, seized our passports, and questioned us about our itinerary. The lead guard reminded me of Basil Rathbone. He had that same sharp-eyed gaze and pursed-lips expression Basil wore as Sherlock Holmes. “Have you taken any photographs?” he asked. I am not an obtuse person. I knew I was treading on thin ice with old Sherlock. I knew I should shut-up and smile, but when I get nervous I suffer from what my Grandpa used to call “diarrhea of the mouth and constipation of the brain.” I blather. Basil frowned, as if not entirely pleased with my knowledge of the Prince’s whereabouts, but I kept right on blathering. Lesson: If you are traveling to London during the summer months, but especially if you are staying within shooting distance of Buckingham Palace, accept that you will be hot and sticky. Forget your notions of what it means to live in air conditioning. You aren’t in America, Land of Arctic Blasting, Sub-Zero Air Conditioners. You are in stiff upper-lip, stiflingly hot Britain. Accept that even in the finest hotels, your room will be hot as a cup of Earl Grey. Whatever you do, do not use your camera’s tripod to prop your window open. We decided to leave the hustle and horror of London behind and head north to the beautiful and historic county of Northumberland. To relax and rejuvenate. We imagined ourselves taking long strolls through the countryside, the kind Elizabeth Bennet would have taken when she was not pining over the vexing Mr. Darcy. I even packed a muslin summer dress and wide-brimmed straw hat, perfect for sojourns through picturesque grassy fields. After a bracing drive down narrow, twisting roads, we arrived at Lea Farm, a charming B & B and working farm, nestled between gently sloping hills. We got out of our rented Range Rover and marveled at the beauty of northern England, taking deep breaths of the clean air and congratulating each other for our brilliant idea to take the trip. I left the keys on the bumper as we unpacked our bags. Suddenly, this Whippet (a breed of dog I find particularly disturbing) comes bounding over, grabs the keys with his mouth, and runs away with them to the pasture beyond. So, there I am in my frilly white summer dress and ridiculous straw bonnet running through a manure laden field after a freakishly thin dog. The owner, who had gone into town to do a bit of shopping, came home later and said, "I heard what happened with your keys. I am sorry. He's a wicked dog, a wicked, wicked dog." Lesson: Always put your keys in your pocket. You never know when a freakishly thin, kleptomaniac whippet might pinch them. When we made our travel arrangements, we considered taking a motor coach tour of England, Scotland and Wales. Although the idea of letting someone else navigate the foreign streets was appealing, we decided we would prefer to rent a car and drive ourselves. We both agreed we were too spontaneous, too flexible (too Type A) to follow the rigid schedules proposed by the tour operators. The idea of being herded onto buses did not appeal to us either. We are cosmopolitan world travels, not cattle. We are not “been there, done that, got the t-shirt” kind of gals. We like to take our time, sip the tea, get to know the locals. So, we rented a car and drove ourselves. It did not take long before our illusion (or should that be delusion?) of idyllic drives down gently curving roads was shattered. Even though we did a lot of cheek clenching on the trip from Gatwick to London, we expected the city driving to be stressful. We did not expect the drive from London to the Borders to be equally harrowing, but it was. It was stomach flipping, palms sweating, pulse racing, sitting on the edge of your seat and praying to Jesus the entire time, harrowing. We were both relieved to leave the motorway behind and travel via the less congested rural roads. Our relief was short-lived. Did I say less congested? Let me clarify. The rural roads in England and Scotland might not have a lot of auto traffic, but slow ambling livestock frequently congest the narrow arteries. As soon as I would feel my confidence growing, when I would unclench and try to enjoy the scenery, a flock of sheep would suddenly appear out of nowhere, clogging the road with their fat woolly bodies. 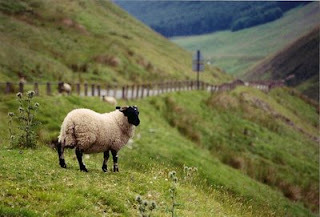 At first, we were pleased to see real, honest-to-goodness sheep cavorting freely on Britain’s byways. We got out of the car and snapped a dozen pictures. But before long, our pastoral pleasure over the bucolic creatures turned into rustic rage. We became livid at the livestock preventing our journey. At one point, we sat in the car, surrounded by sheep, unable to move, for forty minutes. Curb over car. Grip it and hit sister. Two sentences uttered in the midst of extreme stress that had me hooting with laughter. Thank God for my cool-headed, quick-witted co-pilot, otherwise I would have been Sirius Blacking it – you know, straightjacket and maniacal laughter - I would have come home from England strapped down to a gurney, an IV shoved into my vein slowly administering calming doses of valium. Lesson: Unless you are a crash test dummy, do not drive in the United Kingdom. If you are a particularly daring sort, make sure you travel with a supportive, steady co-pilot. Humor can take you farther than a Range Rover. In 2004, we had friends living right outside London and we decided to go visit them. My first lesson learned was NEVER take a 2 year old on a transatlantic flight! Anyway, being world travelers, like yourselves, my husband decided that we'd fly into Heathrow, rent a car and drive to our friends' home. Not thinking about the other side of the road business, he, being a man, knew he had to have a standard, too, and suddenly found himself trying to shift gears with his right hand. Then there's the whole, well, it's not so much a street number as a house with a name! Our friends lived in a charmingly house called "The Old Stablehouse." Not exactly the easiest thing to find when you have just the name of the house and the street it's on! My daughter and I were given ONE job as we tried to follow our friends' directions - MAKE SURE DADDY WAS ON THE CORRECT SIDE OF THE ROAD!! Another hilarious and extremely entertaining article!